It's a big bummer when a band you likes comes through town and you miss it. But your brain can't be expected to track every single show put on by every single band you like. So that's why SongKick Concerts is useful. This app ensures you never miss a concert. It scans every place you go for music—your iTunes library, your Facebook profile, and your accounts on Spotify, Pandora, and Lastfm—to find out what you like. Using your location, it checks when the artists you dig are going to be playing nearby. 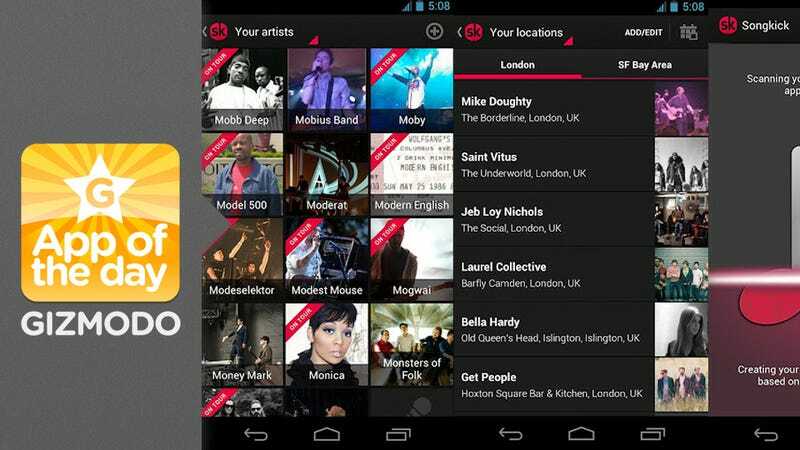 It's been on iOS for a while, but Songkick just made its way to Android this week. It gives you a personalized calendar full of live gigs featuring your favorite artists. You can also search worldwide and build a list of cities you travel to so you can check out live music in other places too.